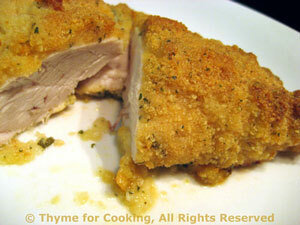 Chicken Breasts with Mustard Crust, easy main course, Thyme for Cooking. The key to giving these a crispy crust is to drizzle them with olive oil after breading, before baking. You could also spray them with olive oil or other cooking spray if you have it. The crust keeps the chicken moist and the mustard adds an unexpected hint of savory sharpness. In small bowl mix mustard, oil, tarragon and garlic. Spread on a plate or flattish bowl. Put bread crumbs on another plate. Roll chicken breasts in mustard mixture to coat thoroughly. Drizzle with remaining 1 tbs olive oil. Bake at 400F (200C) for 30 minutes or until topping is light brown and chicken is done (test if not sure, see techniques).